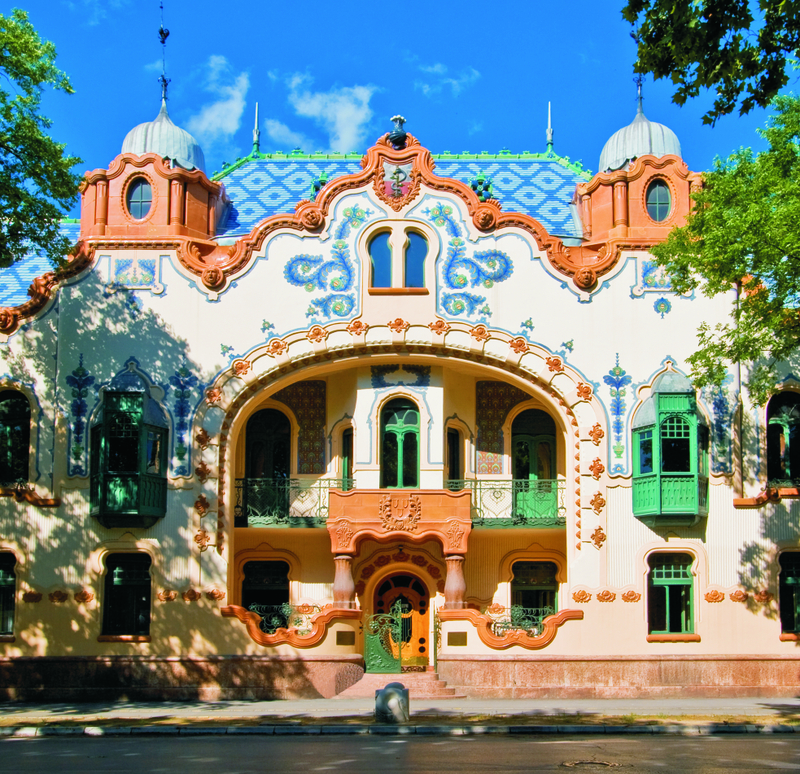 The region of Vojvodina is rich in Art Nouveau architecture. Harmony in general confusion, branching of plant motifs, symmetry that is to be discovered, architectural jazz… In one word: secession – a direction that was born at the end of the nineteenth and early twentieth century thanks to the accelerated urbanization, the development of the economy and the sudden social changes. This line has left its mark on all the arts and areas of modern life. It is not just a style in art but also a lifestyle.n. Thanks to Eden Lehner and Đula Partoš, founders of the Museum of applied art in Budapest, secession gains more and more space in Subotica. 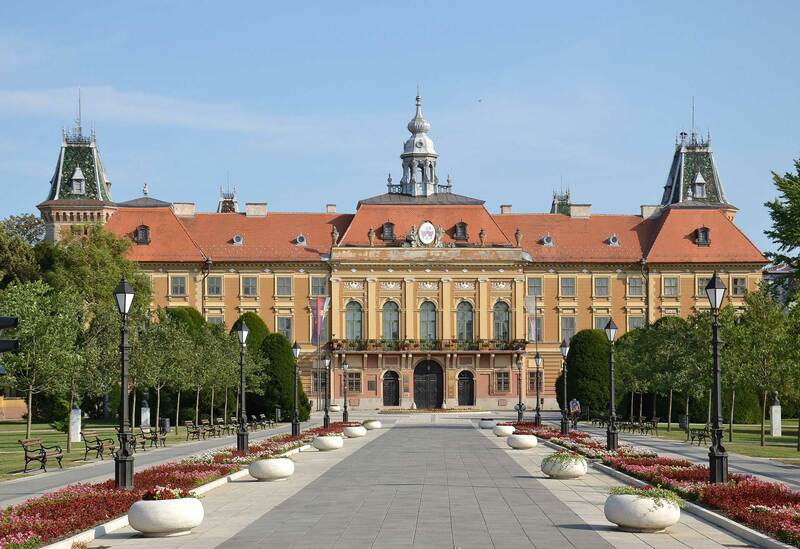 The new style gained popularity by the construction of Leović palace in 1893. While in the centers of other cities most often there is a church or a cathedral, in Subotica above the town rises a tower of the city hall. Designed according to the project of the architects from Budapest, Komor Marcel and Jakab Dezső. The Secessionist decour is enriched by the romantic motifs of Hungarian folklore. Walking through the corridors and halls of the building, if we do not pay attention, we can easily forget about time by admiring the abundance of details of this remarkable artistic treasure. It’s hard not to look at Rajhl’s palace across the railway station. The architect has created this exquisite creation of the Hungarian variant of secession at his own expense. Unfortunately, Rajhl has not enjoyed his remarkable artistic achievement for long, because he has soon lost his home due to material difficulties. The Synagogue, the palace of Rajhl, the former palace of the commercial bank of Subotica, the palace of the hotel Zlatno jagnje, the city rent palace, the Sonenberg rent house, palace ofDömötör Miksa (today the city museum of Subotica). All these buildings have contributed to the city’s rise from one apathetic province from the novel by Kostolányi Dezső in to the present modern city of Subotica. 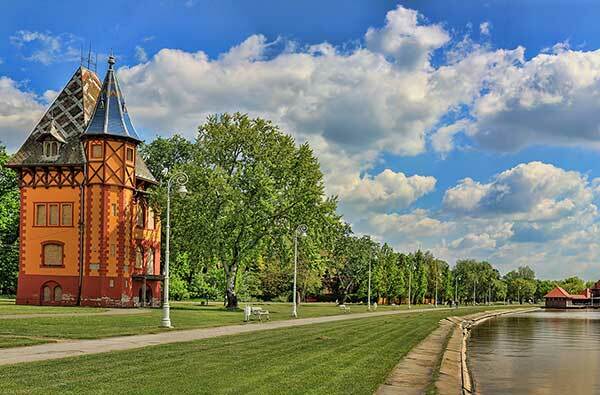 Palić, only eight kilometers away from Subotica, at the end of the 19th century was a very popular spa and resort place. Due to the growing popularity, the need for renovating and extending of the spa resort has emerged in the early 20th century. 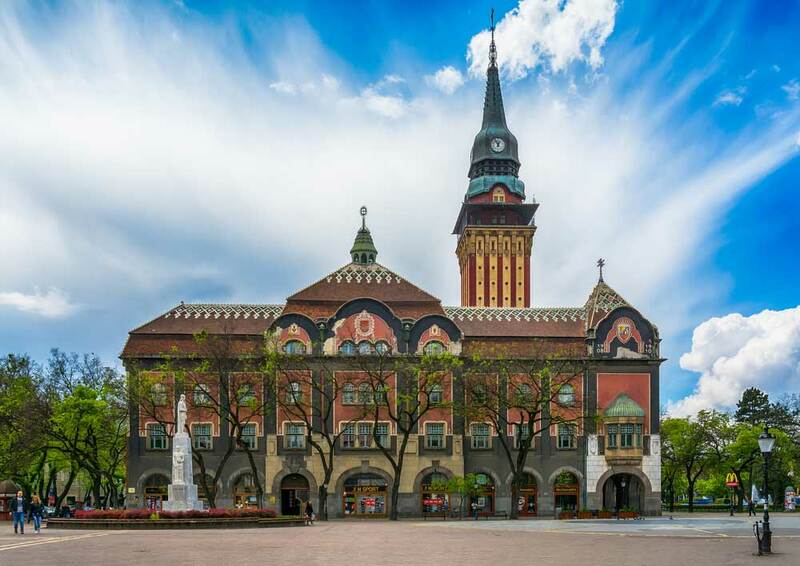 The work was assigned to the famous architects Komor Marcel and Jakab Dezső, who were already renowned for the designing of the Subotica City Hall and the Synagogue. The tandem has started a great work in the spirit of secession, supported by youth, in which the visitors of Palić are enjoying even today. The buildings are inspired by the Hungarian variant of secession and the folklore of Transylvania. They all differ, but they are still connected by the choice of material, structure and familiar red color palette of Palić. Buildings such as the Water Tower, the Large terrace, the Women’s beach, the Musical pavilion and the Memorial fountain were completed in 1912. By the time, each of these buildings became a mark of Palić, and after a hundred years they still attract those who seek rest and fun. 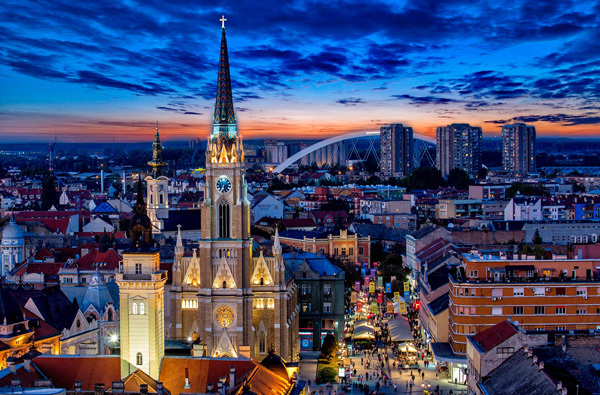 Walking along the center of Novi Sad, the capital city of Vojvodina, we are followed by a divergent line Lipót Baumhorn. After visiting the Synagogue, we recommend a break with a cup of coffee under the Menráth József two-sided palace, and then approaching the center, on the left side, at the corner, opens the sight of the former Savings bank, a double-story style of the Viennese variant of secession. There is an instant and magical sight of Gvozdeni čovek palace built by Pekló Béla. The road continues towards Petrovaradin, and in the fortress, thanks to the legacy of opera singer Melania Bugarinović from Novi Sad, visitors have the opportunity to see an unusual exhibition of secessionist furniture. 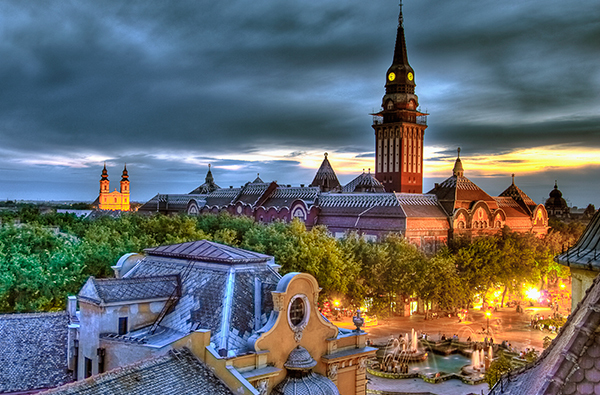 This typical plain town rich in culture, in many ways can be compared to Subotica or Szeged. 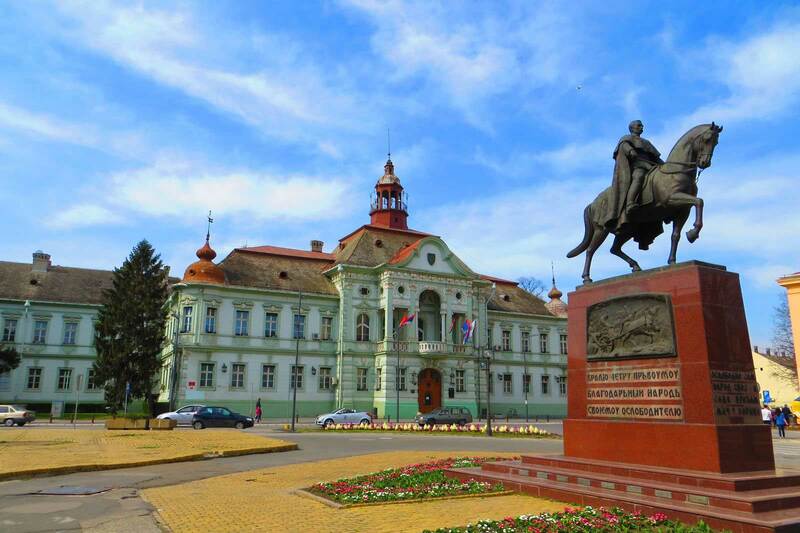 However, the arrival of secession, Sombor welcomed with an already formed architectural features, but it did not even enclose from the new wave which then conquered the cities of Vojvodina. 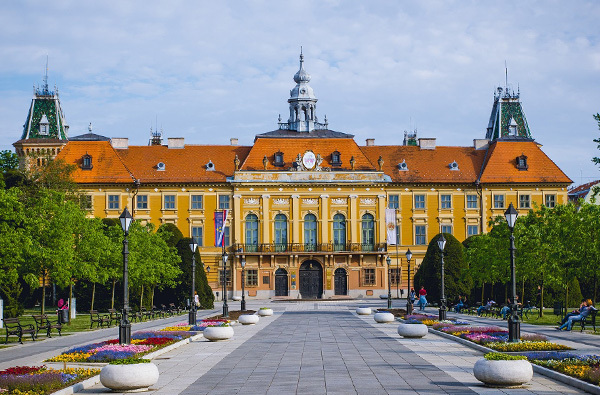 Unlike the above mentioned cities, in Sombor there are no capital buildings of gigantic proportions. There, visitors instead of luxury and pomp, meet a moderate variant of the Hungarian secession, without typical exaggerations. The only exception is the building of the Music school built in 1906, while other sights such as the Vajdinger’s palace or the Konjović family palace conquer with their geometry and cleanliness of lines. The National Cinema was built as a forerunner of a new age in 1914, a vision of a proud Sombor citizen, Ernest Bošnjak, who wanted to turn Sombor into a factory of moving pictures. Apart from top architects, the city also launched excellent Hungarian writers, such as Herceg János and Majtényi Mihály, and in Sombor, one can still feel the spirit displayed in their creations. The history of the most Banatian city or the heart of Banat, Zrenjanin, is firmly linked to the banishment of the Turks and the draining of wetlands. The core of the city was formed on the peninsulas of the Begej river and this is why the river is of great importance for Zrenjanin. The city center preserved its former shape, and the main street, around which the city was built, existed already in 1716. Every house here has its own “story” and is also a cultural monument. The main attraction of the main street is the Town hall built in 1820 based on the project of Joseph Fischer, but its facade is the work of Lechner Ödön and Pártos Gyula from 1887, in the style of neo-baroque. Neo-baroque was later one of the leading styles in Zrenjanin, but here it’s distinguishes itself from other styles with its mixing with secession. The first modern shopping building, the commodity “Bence i sin” was the model of the buildings that followed it, since for the first time architectural solutions were adapted to its commercial function. This example was followed by Lazar Dunđerski who modernized and expanded his old brewery in a spirit of secession. If you find yourself in Zrenjanin, do not leave out Šeherezada! This fairy tale house was built in 1900 on the basis of Bartha István’s project, and the investor was the famous owner of a stonemason’s workshop, Theodore Tuner, who built it for business and commercial purposes. The house also has romantic features, and therefore belongs to one of the most interesting secessionist buildings. 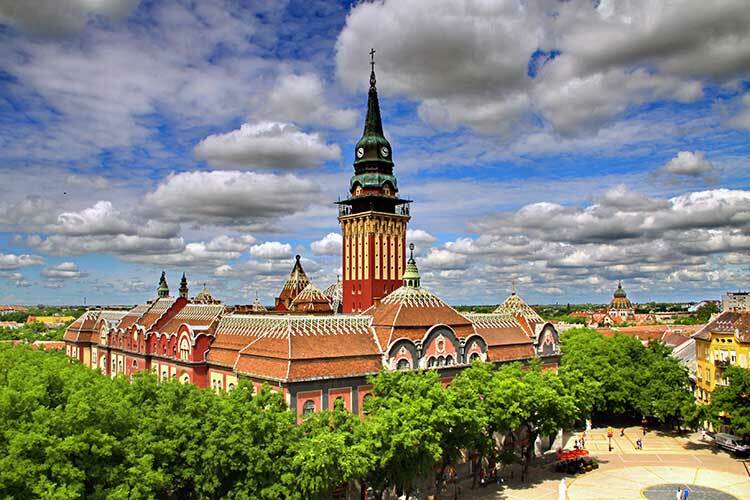 Subotica, the placid town in Bačka with Lake Palić has many tourist attractions.